With its luxe hotels, top-tier entertainment and unmatched dining options, Las Vegas is a fabulous destination unto itself (like we had to remind you), but its unique desert location also makes the city an excellent starting point for unforgettable day trips. From hidden havens on the edge of town to unexpected vitality in Death Valley, we’ve assembled a collection of highway adventures you can complete in less than a day round-trip. During Hoover Dam’s construction in the 1930s, quaint Boulder City was founded to house many of its many workers, and eight decades later, it’s still thriving—and still just as quaint. To explore this Americana gem, drive about 30 miles southeast on U.S. 93, and when you pass under the Art Deco “Historic Downtown” sign, you’ll know you’ve arrived. The road becomes Nevada Way, and is decorated with iconic mid-century modern signs from old motels. Once in the heart of Old Town, amble along sidewalks lined by mom ‘n’ pop eateries like the surfing-themed Coffee Cup, which you might have spotted on Guy Fieri’s Diners, Drive-Ins and Dives. Numerous boutiques abound, selling Southwestern handicrafts, quirky antiques, and touristic tchotchkes. It’s an entirely Instagram-worthy experience, complete with animatronic fortune tellers, funky sculptures, and a “flying saucer” for kooky photo opps. Hoover Dam is astounding, but that’s where most Las Vegas visitors cap off their trips to Lake Mead National Recreation Area. That’s a shame, because there’s so much more to see and do around this sprawling wonder that’s just about an hour from The Strip. Northshore Road, which winds along the immense reservoir, takes roadtrippers through a jagged land of rocky vistas. One of the first mesmerizing sites is Bowl of Fire in the distance, a vast region of orange and red sandstone cliffs. Grab takeout from your favorite Vegas restaurant before you hit the road, and unpack it at Redstone Picnic Area, which is studded with vermillion-hued, eroded hoodoos. Moving further on, keep a lookout for palm tree-ringed Rogers Spring, a classic desert oasis scene. Before you hop on Interstate 15 back to the city, visit the Lost City Museum to learn about Ancestral Puebloans who lived along the now-submerged Virgin River centuries ago. Head northwest on Route 95 just over two hours to Rhyolite, where you’ll find a picturesque ghost town near Death Valley National Park’s border. The abandoned burg is famed for its modern-era cement buildings punctuating the desolate terrain. One highlight is the looming front of a three-story bank made with mining money, and another is a house comprised of thousands of beer and liquor bottles. Also on the road to Rhyolite, take an artsy turn into Goldwell Open Air Museum, where epic sculptures abound, ranging from spooky to whimsical. If all this eye-popping architecture and art stimulates your appetite, swing by the Happy Burro bar in nearby Beatty for a scratch bowl of chili con carne and a cold beverage. To take in a landscape that’s both gorgeous and eerie, journey to Death Valley Junction, a crossroads about 90 miles west of Las Vegas. Take Blue Diamond Road off Las Vegas Boulevard through forested Mountain Springs Pass, eventually making your way to the Amargosa Valley. After arriving at the junction, ramble about the unmistakable Amargosa Opera House and Hotel, which hosts ballet and pantomime performances on weekends in an ornately painted performance hall. The charming onsite Amargosa Cafe serves farm-to-table breakfasts and lunches Friday through Monday. And if you’re into nature, stop by Ash Meadows National Wildlife Refuge, with its gurgling pools of crystal-clear water, the craggy Funeral Mountains looming in the distance, and the entrance to Death Valley just beyond. Long before Las Vegas was illuminated by glittering neon lights, it was a Wild West crossroads and ranching outpost. But just because you were born within the last 100 years doesn’t mean you can’t relive those cowboy days. Head to Bonnie Springs Ranch in beautiful Red Rock Canyon National Conservation Area, located just west of town off Blue Diamond Road. Ride a mini-locomotive into this frontier throwback featuring a recreated mining town with vintage shops and horse rides. The attraction is also known for its farcical send-ups of melodramas and gunslinger showdowns. Sure, everything is a bit on the hokey side, but it’s good, dusty fun. There’s a restaurant for rustic vittles like a bison burger and BBQ ribs, plus a bar and saloon to wet your whistle. For even more history, visit adjacent Spring Mountain Ranch State Park. Its grassy spaces and ranch house filled with antiques was once owned by none other than Howard Hughes. If you’re a fan of retro-themed travel, head down to Route 66, the ultimate classic road trip byway. 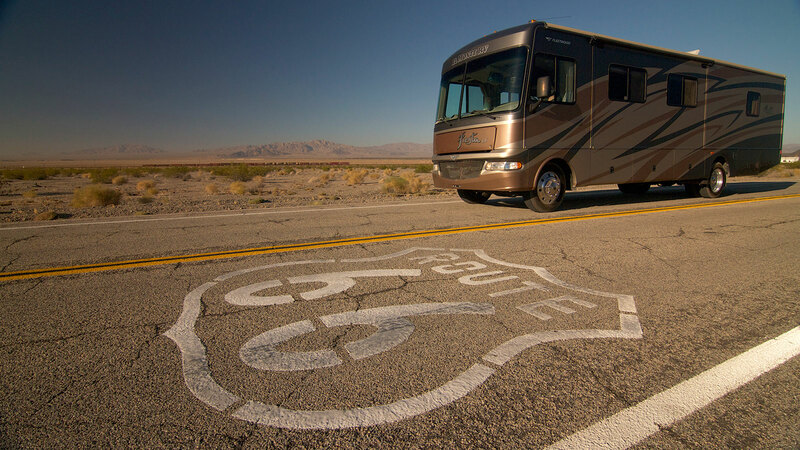 To reach the “Mother Road,” head south on Interstate 15, where you’ll enter the vast Mojave National Preserve just across the California border via the Nipton Road exit. From there, drive to the park headquarters at Kelso, and explore the renovated Mission-style train station. Then it’s on further south past lofty granite peaks and shifting sand dunes to Route 66 itself near Amboy and the much-photographed Roy’s Motel and Cafe with its unmistakable Googie-style sign. Order a bottle of chilled root beer and meander about the old motel area, which now serves as an unusual sort of art gallery. If all the driving has you feeling restless, take a quick hike around nearby Amboy Crater National Natural Landmark—a stark black extinct volcano—before hopping back in the car to Las Vegas. No matter which of these day trips you choose to try, it’s always important to keep your car’s gas tank filled—stations are few and far between once you leave the Las Vegas metro area. And this is a desert, so carry at least a gallon of drinking water per person. Sunblock, sunglasses, hats, dressing in layers, and snacks are essential, too. And maybe a portable charger for your phone—you know you’re going to be posting pics and vids the whole time. Start Discussion *WOW!! what about the dam tour?? Start Discussion *Hello to all. I’m so glad to find myself in the arena of planning a vacation. I haven’t been able to fully utilize any time to make preparations for anything like this before. I’m excited and I look forward to seeing everyone in the new year of travel. A different Route 66 day trip if you don’t mind doing some mountain driving. Go south out of Las Vegas on I-15 to the Nipton Road exit in Cal. (Exit 286) Follow Nipton Road back into Nev. where it changes to Nev. route 164. This will take you through a large Joshua tree forest. When you reach Searchlight (home of Senator Harry Reid) go south on US 95 to I-40 east which has replaced Route 66 here. There are old alignments of 66 in Needles Ca. but stay on or get back on I-40 and take it to the first exit in Arizona after crossing the Colorado river. This will put you on old Route 66 which is also marked as Az. 10 and is called the Oatman Highway. Follow it into the town of Oatman where you can visit all the old stores and feed the friendly burros that wander the streets. Continue east on Route 66 over Sitgreaves Pass and into Kingman Az. The Powerhouse Visitor Center in Kingman has lots of Route 66 information and memorabilia. To return to Las Vegas take US 93 northwest out of Kingman. When you near the Colorado River you can cross the river on the new bridge or take the old US 93 alignment across the top of Hoover Dam. Follow US 93 in Nev. to I-11 / I-515 and back into Las Vegas. Two other great trips if you are an outdoorsy type are Red Rocks State Park at the western edge of town and the Valley of Fire State Park about 40 miles north. Red Rocks is a great hiking area and rock-climbing area. If you want to climb, it is smart to hire a guide from one of many Las Vegas guiding services. Valley of Fire is an amazing hiking and climbing area. Falcon Guides has an excellent beginner set of hikes. If you have time and gear, it is an outstanding camping or car-camping area. Know how to navigate off trail if you plan to wander off the trails.